Click here to book a card session with Derek. 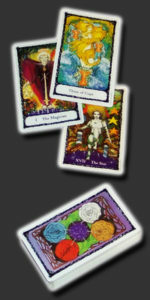 Fortune telling is the most known application of the Tarot. However, you have to bear in mind that the Tarot does not unravel a rigid or predetermined Future; you can take your destiny in your hands and use your free will. The Future interpreted during a reading is given as a possibility rather than a certainty. In other words you are the boss and no one else can live your life for you! Another less obvious application of the Tarot is to help you to see problems from other angles and to give you freedom of choice and possible solutions rather than feeling stuck in a situation with no choice or hope. In that respect, Tarot reading can be used to great effect to ease concerns and anxiety when it seems that nothing can be done. By analysing the events of the past which have lead to the present situation, better understanding of the roots of a problem can be made and therefore a clearer direction can be undertaken, leading to a more confident and fulfilling life and future. By accepting the truth without the ego clouding the picture, you can make the necessary positive changes in your life. When conducted with professionalism and care Tarot readings in their most positive aspect can bring a genuine sense of inspiration and enlightenment, a sense of seeing clearly what was before murky and dark. Its guidance through a rough patch can boost your confidence and can also change your view on life. By laying your life on the table (literally), you have to feel confident and at ease with the person undertaking the reading. A Tarot session should be enjoyable and positive, even when life seems to be difficult, as there is always light at the end of the tunnel! When conducted with professionalism and care Tarot readings in their most positive aspect can bring a genuine sense of inspiration and enlightenment, a sense of seeing clearly what was before murky and dark. Its guidance through a rough patch can boost your confidence and can also change your view on life. By laying your life on the table (literally), you have to feel confident and at ease with the person undertaking the reading. A Tarot session should be enjoyable and positive, even when life seems to be difficult, as there is always light at the end of the tunnel! You can now try a Live card reading online /chat or on the phone. Book here now! 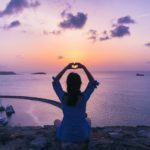 12 tips to help you relax & combat life’s challenges with anxiety, stress and worry. A Happy Medium shared a post. Sometimes we face hard and difficult challenges, but when we look back, we see how strong we became and how we did, we take strength from the fact we coped. A Happy Medium is at Park House Business Centre.